Now that fall migration is underway there will be many opportunities to see lots of different birds passing back through TN on their way to Central and South America. The Blue Grosbeak is one of those birds and while not rare one usually has to put in a little leg work to find. Unlike the Rose-breasted Grosbeak that regularly visits feeders in the spring and sporadically in the fall, the Blue Grosbeak rarely visits feeders. In fact, we’ve only had a handful of reports of Blue Grosbeaks at feeders over the course of my 23 years at the store. This is curious to me because both Grosbeaks seem to share similar food preferences. The Blue Grosbeak is about 7 ½” in length, a Cardinal sized bird. The male is a deep blue, similar to the Indigo Bunting, with a thick conical bill (slightly narrower than a Rose-breasted’s), and has broad, rusty brown wing bars. They are commonly seen in or adjacent to scrubby fields and meadows. Fields that have not been cut are more likely to produce these beautiful birds. I have seen them on the Harpeth River Greenway, Hidden Lakes Park, and Gossett Tract. 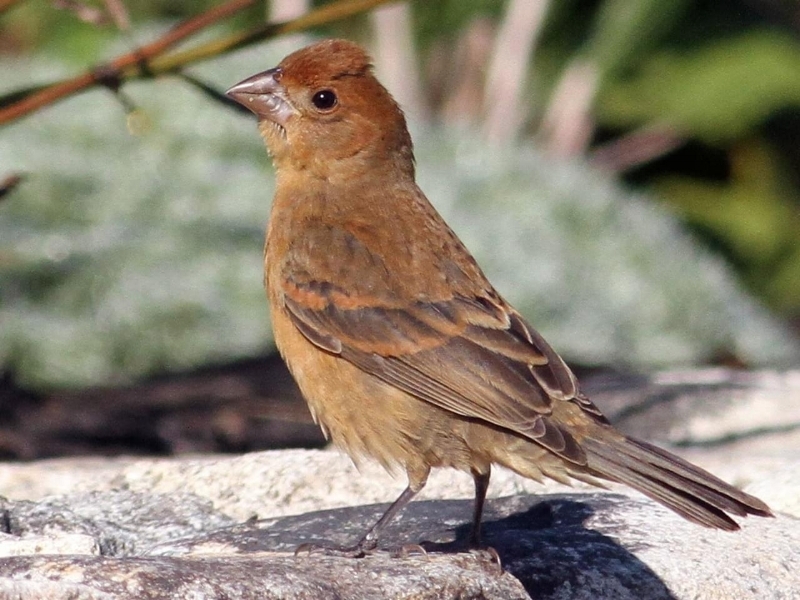 The female could easily be mistaken for a female cowbird. Look closely for the soft brown plumage above and lighter brown below, with 2 buff wing bars. Have the binoculars at the ready because the next 8 weeks will be full of nice surprises if you get out and look a little harder. And in your own yard a good clean and consistently available water source can produce some very interesting visitors. Next week more on hummingbirds and the hummingbird celebration taking place at The Warner Park Nature Center August 25th.